Description: This module is a simple single that has a road crossing on the diagonal across the module. It was inspired by a photo of a Real transport environment where BHP transported their newly painted SD-40's via road to its facility in the Pilbara in North Western Australia. 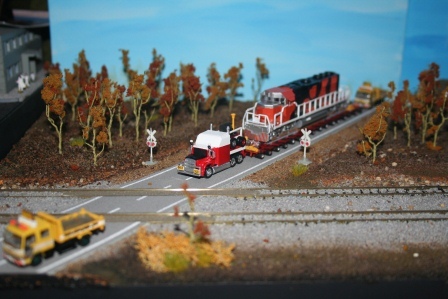 They also moved sd70 ACe's via this road transport technique. I scratch built the road train tray from styrene and modified a SD 40 to represent the BHP billiton model. The Kingston Mack Prime mover was a kit bash of a few different trucks to obtain the look I was after. A couple of small tray trucks were used to represent the Protection vehicles that travel in front of and at the rear of a heavy wide load. This is very typical of the practice used for road transportation of wide loads across all of Australia. At an exhibition I always include the prototype photo shot clipped to the skyboard. Because of the prototype nature of this module it has been very well received when displayed in public.